so, on this last day of the year, i think back to times past. flipping through my parent's photo albums, i found these. 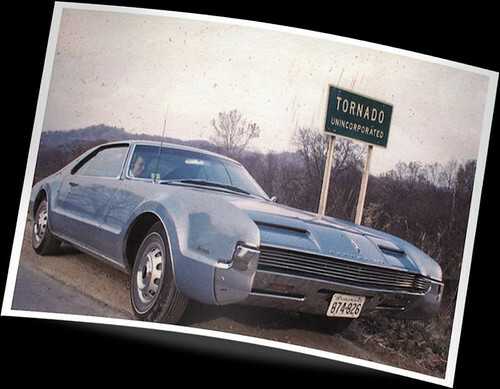 i vividly remember this oldsmobile tornado. the thing was built like a tank, and had huge tires, at least relative to my size. 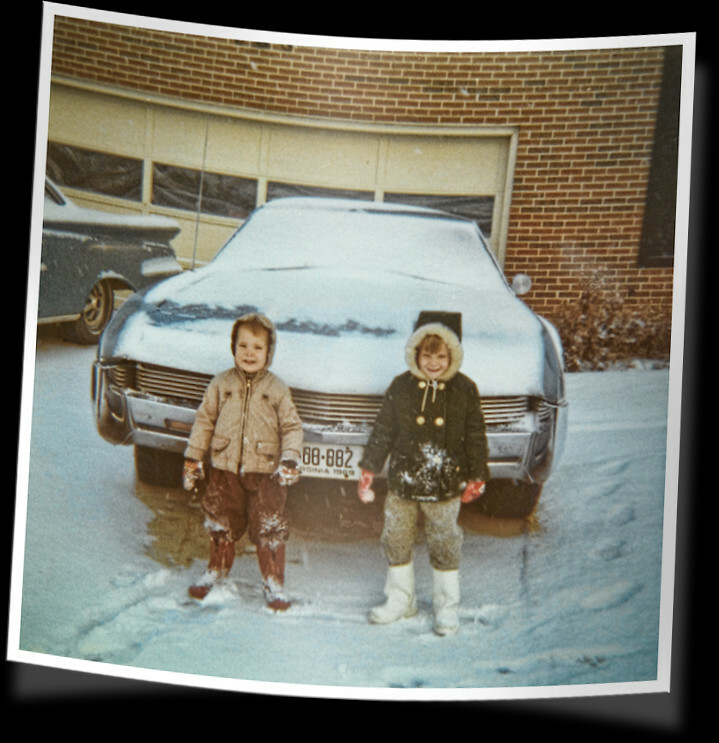 that's my younger bro and me in the snow, when we lived in virginia beach. i look a bit evil in this shot, but i think i was just trying to look at the camera and keep the snow out of my eyes at the same time. my dad was pretty stylin' in that plaid jacket. lol. that must have disappeared before i was born, as i don't remember ever seeing him it or having it in his closet. every year, back before seat belts were required, my dad would drive us 10 hours to my grandmother's house in west virginia at thanksgiving. i'd be crawling around on the floor space under my mom's feet up front, sometimes with a pillow and taking a nap. lots of leg room, or was it that i was just small? we'd have to put snow chains on sometimes to get over the mountains, and my dad drove like a maniac then...and still does now. he never wanted to stop, just drive straight there, but with kids, my mom wouldn't let him; kids get really cranky when they're hungry or have to take a whizz. we'd stay a few days there, get the creeps down in gramma's basement, which always smelled like mold, and was always very cold. then we'd turn around and do another 10 hours home. joy. i wanna say there was space under the back window, behind the seats you could lay on and watch the clouds go by, but maybe i'm thinking of just the back seat. i'll have to ask my brother with the seemingly photographic memory. i don't know why, but every year, maybe every other year, my dad would have us out sanding all the paint off, and then he would primer it, then sand it again. then paint it with a couple of coats of the same blue every time. i don't remember it having scratches or anything, he just seemed to like using his paint gun, and maybe he was just bonding with my older bro. guess i'll have to ask. when i was old enough to drive, i finally got the keys to it. 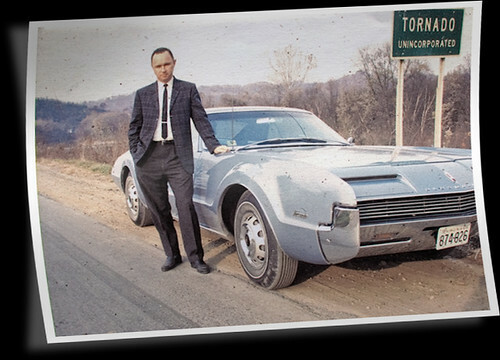 i drove it to work for a couple of months, before it went christine on me. i think the brakes went out as i was coming to a four-way stop. fortunately, there wasn't anyone at the intersection and i somehow wrestled the thing into a parking lot and whacked it up against a curb to stop it. freaked me out so much, i don't think i ever drove it again. he sold it a year or two later. 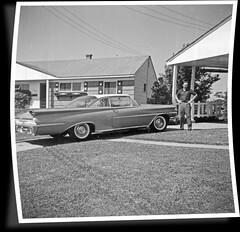 he also had this 1959 oldsmobile 98 for a while; i think that's the tail end of it in the picture with my brother, but i don't remember it at all. my mom says it was their first car together, and it was pretty nice. i would rather he'd kept that one, but oh well.